Golden Riviera Mobile Casino :: Santa Paws mobile slot – PLAY NOW! (December 1, 2014 :: Press release) – Santa is going to deliver a festive new game for mobile players at Golden Riviera on Monday, 1 December 2014. Santa Paws is set to be the perfect stocking filler and promises great entertainment for players looking to begin their Christmas celebrations early. Whether players have been naughty or nice, Santa Paws delivers quality entertainment with a cheerful Christmas theme. Set in a snowy landscape, the friendly animal characters are looking to celebrate the holidays and help players spin their way to success. It’s a 5-Reel, 20-Payline Slot with up to 12 Free Spins and a mystery Multiplier of between 2x and 7x plus a chance to win even more at a later point – the perfect gift for any player. 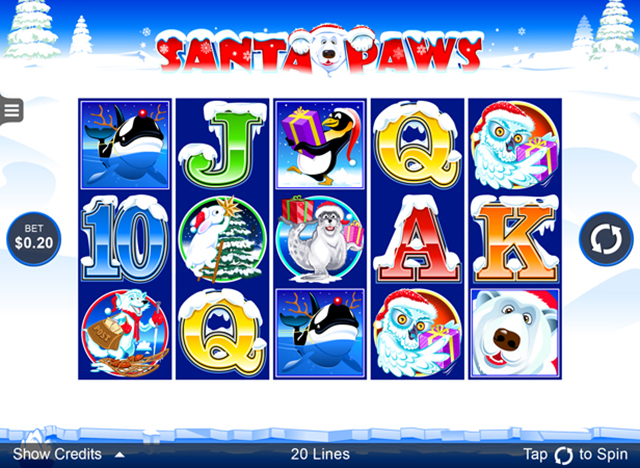 Santa Paws offers jackpots of 20000.00 in the base game, with that soaring up to 140000.00 during Free Spins. This is the latest game on offer, but there are more than 30 mobile games available and because they are provided by Microgaming™, the world leader in gaming software, they are guaranteed to boast superior functionality and payouts players can trust. Banking security is a top priority and a range of banking options are available, from credit cards to web wallet services. All banking and personal information is carried over 128-bit encryption technology, an industry standard. But should gamers have any queries or need assistance they can contact the multilingual contact centre. It is open 24/7 and is available via live chat, email and toll free number. Combine this with secure banking and the eCOGRA seal of approval, players are in the safest hands in mobile gaming. New players at Golden Riviera Mobile get started with a generous 3-Tier Deposit Bonus of up to an impressive $/€1,400 Free over their first three deposits. Their first deposit is matched 100% up to $/€150, which means when a player deposits $/€150, they play with $/€300. The second deposit is matched 25% up to $/€500, meaning when they deposit $/€2,000 they actually get to play with $/€2,500. And the third deposit is matched 50% up to $/€750 – deposit $/€1,500 and play with $/€2,250! Golden Riviera Mobile Casino is part of Vegas Partner Lounge (VPL) – a gaming group that has been around for over 12 years and hosts some of the most prestigious casinos in the online environment. Other brands within the VPL Group include: Crazy Vegas Casino, Crazy Mobile Casino, Golden Riviera Casino, River Nile Casino, 777 Dragon Casino, Maple Casino, Maple Mobile Casino, Casino-Mate and Casino-Mate Mobile.